American whiskey, particularly bourbon, is experiencing an explosion in popularity not seen since…well, not ever seen, really. Our little brown spirit was practically left for dead in the 70’s. In the late 80’s/early 90’s it started to claw its way back into favor, and today, it’s selling like mad, and not just domestically. Unfortunately, it’s also teetering on the edge of becoming an over-priced, over-hyped, silly circus like the Scotch category has become, but that’s neither here nor there. 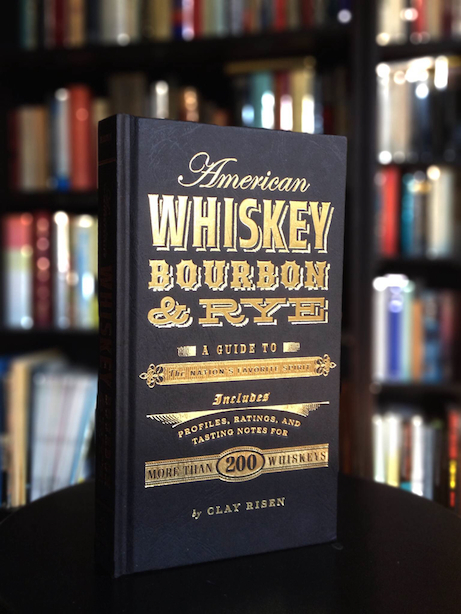 Clay Risen, the author of American Whiskey, Bourbon and Rye, perfectly timed his book to fill the need for a concise guide to this rising tide, one that will definitely appeal to new fans as well as satisfying those of us who think we know it all. Coming out in November of 2013, American Whiskey, Bourbon and Rye is a beautiful little octavo hardcover that covers, as you might have guessed from the cryptic title, whiskey made in the USA, including but not limited to, bourbon and rye. Risen, currently an editor for the New York Times, is a prolific writer having penned several books as well as articles for the Atlantic and Smithsonian among others. While he’s spent a good deal of time writing about whiskey and other spirits, Risen has also focused on the US Civil Rights movement. His latest book, “The Bill of the Century: The Epic Battle for the Civil Rights Act,” was just released earlier this month. American Whiskey, Bourbon and Rye is broken up into more or less two sections: the “introduction,” and “whiskey accounts” which is just fancy talk for “the review section.” The lengthy introduction details what you’ll find and won’t find in the book, and the now ubiquitous (and apparently required by law for any whisky book) section detailing what whiskey is and how it is made. After that, Risen embarks on a taught, well-researched journey through the history of whiskey in this country. In a span of less than 30 pages, he traces its beginnings, its highs and its lows in a factual, warts ‘n’ all manner, instead of going over the top with anecdotal humor and flowery praise. In the 10 or so pages after that, the book focuses on the state of American whiskey today, touching on the positives and negatives of the “craft” distilling movement, white & flavored whiskies, and the industry’s move away from age statements. The final section of the “introduction” gives pointers on how to read a label, how to appreciate whisky, and how to host a tasting. The “whisky accounts” section refreshingly reflects a panel of tasters that was hard to impress – Risen does not pull any punches here. The hype of the more popular releases is tossed aside, and “craft” whiskies are not given undue credit just because they’re new and trying hard. For each entry, a quick summary of brand info is given along with compact tasting notes and a general impression. The whiskies are all given an out-of-four-stars rating and slotted into a price range. Collections of reviews like this always contain a few head-scratchers, but by and large this is a thorough and reliable group of American whiskey reviews. My only qualms with the book are petty. Occasionally, Risen lets his personal bias out a bit much for a book that otherwise comes across as a general guide (the guy really doesn’t like cocktails). But he’s a very knowledgeable host, so that can be forgiven. Also, I’m no Chip Kidd and I hate to disparage an otherwise beautifully designed book, but there’s really no reason that first 70 pages or so needed to have both very small type and lots of empty page space. I’m all for creative book design, but if you’re hoping people will actually read your book, then form should follow function. Other than that, I think this is a great book, one I find myself referencing often when looking at American whiskey. It’s a thorough, appreciative, no-nonsense guide that deftly walks the line between romanticizing its subject and being overly critical of it. Required reading if you’re a whisky fan of any kind.